Opened in 2010, this award winning hostel, it is located in the centre of the medieval city of Brasov, in Transylvania. A stones throw from the Piata Sfatului (Council Square) and the Black Church, it boasts an incredible location with easy access to Brasov’s public transport. 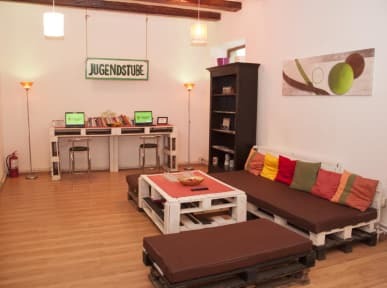 We like to keep things personal here at JugendStube Hostel Brasov and want you to leave feeling like you've made new friends and found a home away from home. That's why we have private rooms and most of our dorms are 4 bed and our biggest is just a 6 bed. Smaller dorm rooms means a better nights sleep and most of our rooms have private bathrooms too, so you don't have to wait ages for a shower! With our 24 hour reception it doesn't matter whether your train arrives late or you have a late night, we're always on hand to help. Our shared kitchen area, like the rest of the hostel, is kept clean and tidy and our chilled out communal room is a great place to relax . At JugendStube Hostel Brasov all the rooms have access to Wi-Fi and we're always working on improving things for our customers. All of this, along with a great price, is why JugendStube Hostel is one of the best hostels in Brasov! Great location, helpful staff, very very clean - they clean the bathroom after every use. Good free breakfast too!